The display timeout is one of the most important battery saving functions on your mobile device or tablet. Sure there are plenty of other functions, hardware and tasks that help conserve energy but let’s face it, in most cases the display is what eats away at that battery life. The timeout settings ensure that the screen turns off when a smartphone or tablet is not in use, thus conserving precious juice. Unfortunately, it can really get in the way sometimes like when you’re reading an ebook, playing games or even watching movies. Those tasks don’t require you to interact with the screen often, which means every now and then the timeout function could kick in and turn off the display. 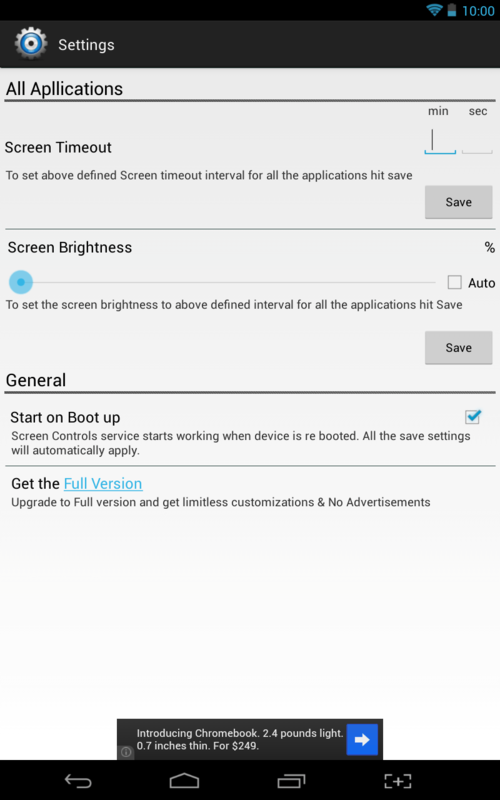 Screen Controls is an Android application that allows you to configure custom timeout settings for separate apps installed on your device. Screen Controls is an Android application that will allow you to completely customize the timeout function pertaining to individual apps installed on your device. For example, you can set the timeout to take much longer to turn off the screen while you’re reading an ebook or magazine. You can also set a custom brightness level for installed apps, which can be useful for many things. For instance, you could dim the screen for apps that have a very bright and colorful UI, yet brighten the screen for apps that don’t. 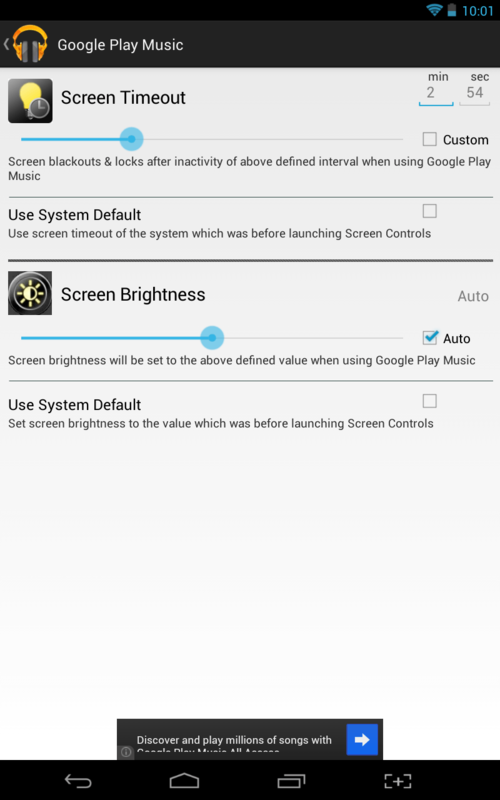 By default, unless you have the brightness settings in Android to auto you have to enter the OS settings to configure the brightness and timeout every time. That means, in the case of various apps you always have to configure the settings beforehand. Needless to say, that can be a bit of a hassle at times. 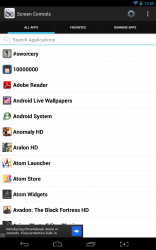 Screen Controls allows you to configure specific options that work for each app installed on your device individually. That means you can crank up the brightness while you’re watching movies with the YouTube app, and turn it down again when you’re looking at a dark themed ebook. The same holds true for the timeout settings, which are designed to automatically turn the screen off when not in use. There are occasions where it would be beneficial to turn the screen off after 30 seconds of inactivity, and adversely times when it would be necessary to increase it to 2 minutes or more. As soon as you load the application you will see three separate tabs, one for each type of potential app installed on your device. More specifically, you will see tabs labeled “All apps,” “Favorites,” and Running Apps”. To be perfectly honest, it’s pretty self-explanatory what each of them offers and what they’re for. 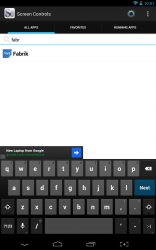 There’s also a search box just below the tabs, so you can pinpoint a specific app. To customize settings, you just need to select the related app in one of the lists and you will be brought to a sub-menu. On this screen you can setup the various brightness and timeout parameters. You can set the options to a custom level, or you can just use the system default setting. Really, it’s that simple to use. In the app settings, you can change the various settings and apply them to every app installed on your device if you so desire. 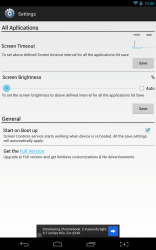 Screen Controls can also be configured to run as soon as the device boots. Just in case I haven’t explained it enough, and you’re still wondering why you would want an app like this I’ll lay it all out in a more personal scenario. At night, usually when I’m not very tired I like to read ebooks on my tablet. While I’m reading, obviously I don’t interact with my screen very much and this causes the device to turn off on me. I like to keep my display timeout settings low, as this conserves my battery fairly well when I put the device down. Anyway, this app allows me to set a longer timeout period for my reading app, yet retaining the short timeout by default. Screen Controls uses 44MB of RAM while running, which could be an issue because if you close the service the individual settings don’t seem to work. As you can see, that’s a pretty hefty resource load. Furthermore, the free version of the app includes advertisements. As far as I can tell, there are no functionality restrictions or locked features though. The ads can simply be removed by purchasing the premium version. 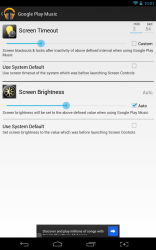 Screen Controls is an Android application that allows you to configure brightness and display timeout settings for every app on your device separately. It’s useful in situations where you want the inactive timer and brightness levels to be different for a particular app. For example, if you want the screen to remain on while you’re reading an ebook in your favorite ereader app. 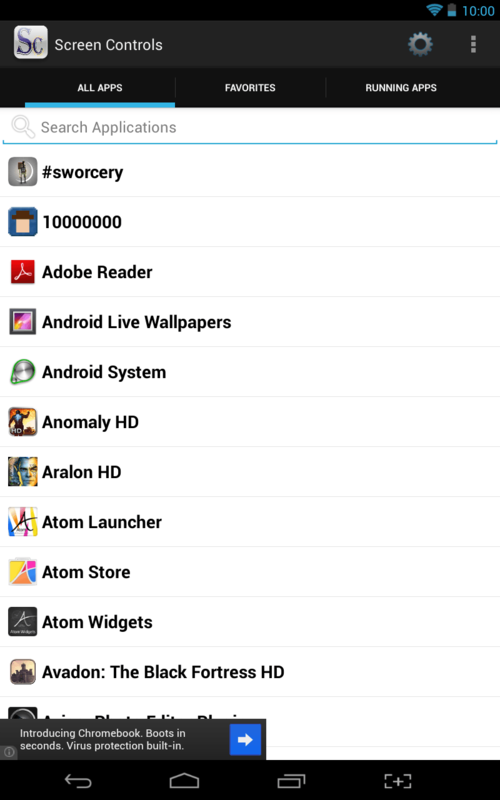 You can also use default settings, or batch configure apps as you see fit. Unfortunately, the app seems to use quite a bit of system resources and there are unobtrusive ads. The ads can be removed by simply purchasing the premium version for $0.99. Personally, I find this app useful because I like to keep a very short timeout period for my device, while altering it a bit here and there for individual apps.